The Great Recession had a substantial impact on children across the United States, particularly for children of immigrants. From 2006 to 2011, the poverty rate for children in the United States jumped from 17 percent to 21 percent, while for the one-quarter of children in the United States with an immigrant parent, poverty jumped from 21 percent to 26 percent. 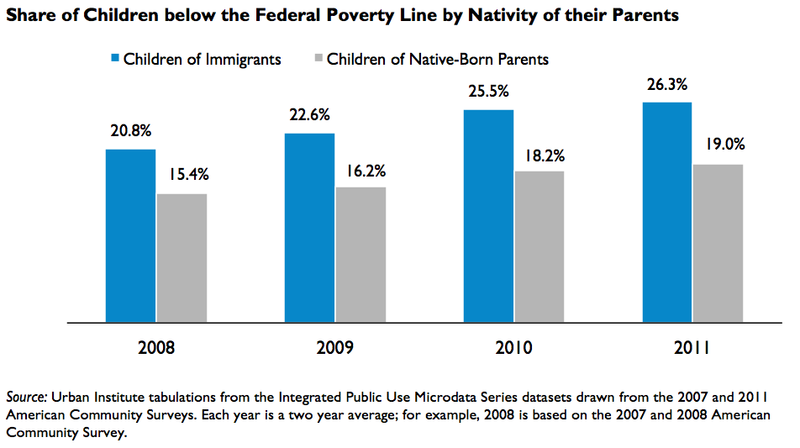 The result was a bigger gap in poverty rates between children of immigrants and children of native-born parents. The increase in the share of children of immigrants in poor families occurred in almost every state. As our new interactive tool shows, the poverty rate for children of immigrants was above 30 percent in 15 states in 2011, compared with only 3 states in 2008. Children in immigrant families are not just more likely to be a part of a poor family— they are also less likely to receive services designed to help lift them out of poverty. In 2008, 69 percent of children with native-born parents living in poor families received SNAP benefits, compared with just 45 percent of children of immigrants living in poor families. The disparity is similar for TANF, with 18 percent of children of native-born parents living in poor families receiving TANF benefits, compared with just 11 percent of children of immigrants living in poor families. With so many children of immigrants below the poverty line, it is important that they be able to access the social safety net, but these families may face unique barriers. Research has shown that the many challenges they often encounter include language barriers, administrative hurdles, and some unauthorized immigrants’ and refugees’ reluctance to interact with government agencies. This research suggests methods for increasing children of immigrants’ access to needed supports, such as interpretation and translation services, flexible modes of application and documenting eligibility, working with trusted community organizations, and clarifying eligibility rules for mixed immigration status families, among other policies. It is important to understand the characteristics and recognize possible risk factors of children of immigrants so that policymakers and service providers can work to ensure the healthy growth and development of this growing subset of the country’s young population. Related Urban research: Children of Immigrants: 2011 State Trends Update; statistics across states and over time from the Children of Immigrants Interactive Maps; even more statistics across different demographic groups on the Children of Immigrants Data Tool.